Aloha, everyone! After a week in Maui, a few days in So Cal and a crazy week back at work, I finally have a moment to recap our wonderful day. There were quite a few things that I kept on the DL during planning and now I can spill the beans. I also have a few fabulous vendors to brag about, including my photographer, Dean Thorsen of Thorsen Photography. Please credit him if you borrow any images. After much internal debate and a little help from the hive, I had settled on a lovely gold pair of Jimmy Choos. I later realized that I could buy Jake a nicer band if I exchanged those wonderful shoes for a less expensive pair. Back to Nordstrom they went! 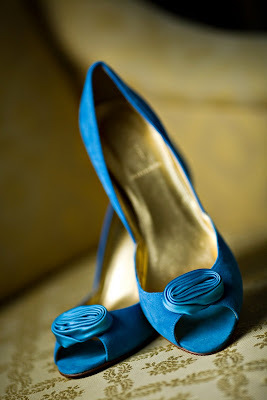 I had been wanting a blue pair anyway and these blue suedes from JCrew were just the ticket. Next, my dress. Jake was adamant that he did not want to see my dress before that day. He reads my posts on the WB regularly, so I needed to save the big reveal until after he saw me. Here she is, in all her glory. I loved my dress so very much. You will see in later photos that there was a strap of fabric around my neck like a halter. I think it is so classic looking. Sigh... good thing I got to wear her one more time (more on that later!). Lastly, the jewels. I had purchased some warm gold beaded earrings and an opera length necklace. When I had a dress rehearsal the week before the wedding, I realized that it was too much. My aunt had lent me a pair of my Grammy's earrings to use as shoe clips. They were the perfect vintage touch. I had already planned on wearing her wedding band on my right hand. My Grammy had passed away when I was two, so any way to have her there with me was a wonderful gift. More on that first ring later! The center ring is Grammy's band and my engagement band at the end. 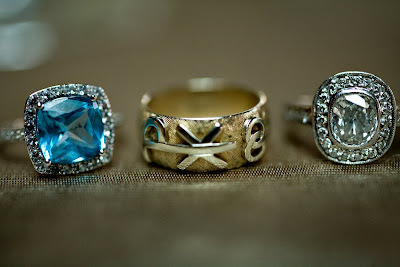 Old, new, borrowed and blue all on my fingers. your rings!!!! your dress!!! your shoes!!!! i'm just drooling over here. i'm so happy for you. thank you so much for coming back to update! Oh my goodness... I love everything! 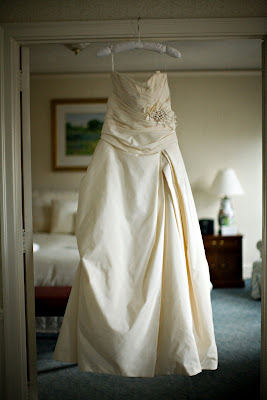 Those shoes and ring are right up my alley... and I am love with the detailing on that dress! Thanks for sharing!! I truly adore those shoes.... delicious. And that blue ring is incredible! Can't wait to hear more! wow!! everything looks amazing! your rings are incredible! I love your shoes and your rings! Your dress is beautiful! i so cheated and looked at the entire wedding on Dean Thorsen's site... I LOVE IT! I can not begin to describe how magical the entire event looked! Beautiful, absolutely beautiful! those shoes are gorgeous!! i'm so glad that you chose to go with them! beautiful!! I almost bought those same shoes for the same reason! I love them. 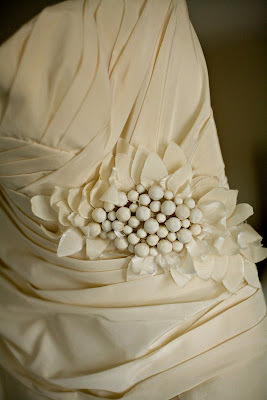 The detailing on your dress is incredible. You're beautiful! I can't wait to hear about that aquamarine ring! Love the shoes. Love the dress. I really love the first ring. It is my birthstone aquarmarine. your rings!!!!!!!!! to die for!